Shoe collectors... I will be listing about 100 pieces from a shoe collection of boots ,shoes, and booties. 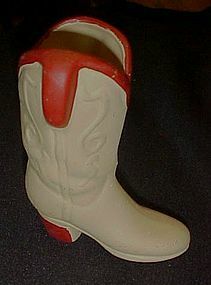 THis is a hand painted ceramic cowboy boot thay measures 4 3/4" tall. Hand painted but unglazed. Pefect condition with no damages.